Rawfell Self-cateringIf you are looking for a comfortable retreat for a family holiday at any time of the year you really need look no further. 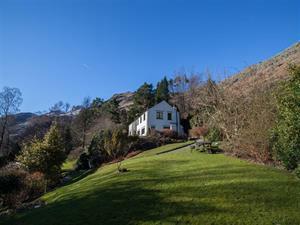 This most desirable holiday home is in a truly delightful setting in the magnificent valley of Great Langdale. The house has a great sense of peace and privacy surrounded by its own large well-tended garden (a former prizewinner in the Lakes Parish in Bloom competition), with a host of delightful trees and shrubs, sweeping lawns and a sunny south facing patio. There are stunning Langdale Valley views all around, visible from most rooms in the house and some of Lakeland's most dramatic walks can be done from the door. A number of pubs serving good food and drink close by, the nearest being only half a mile away just down the valley. Rawfell has membership of the exclusive Langdale Leisure Club which is within a few minutes drive of the property. Accommodation: Long driveway through the gardens to the parking area in front of the main entrance. Level access into hallway. L-shaped sitting room has leather sofas, multi-fuel burning stove (Sky TV with Freeview, DVD, CD/radio/cassette, ipod/iphone dock, pool table and free Wi-fi) and leads through to the most attractive farmhouse kitchen with its oil fired Aga - large windows overlooking the gardens. One step up from the hall accesses a large ground floor bedroom with either twin beds or zip/link on request. Separate shower room with basin and wc. Separate utility room has plenty of space for storing your outdoor gear. Back door to garden. Three further bedrooms upstairs. The large master bedroom has a king-size bed and large windows to two sides providing wonderful views. There is another bedroom with king-size bed which also has views over the valley and garden. At the front of the house is a twin with en-suite (shower, twin basins and wc). Large family bathroom with large power shower, basin, bath with hand-held shower and wc. Furnishings throughout are comfortable and stylish with fitted carpets. Large windows create a light and sunny feel making the most of the views. Outside: Gardens extending to one and a half acres which are a delight in all seasons - beautiful shrubs, colourful foliage and blossoms and many special plants. Sunny patio with picnic table and patio furniture. Parking in the drive for up to three cars. Small stream. Useful small garage at the bottom of the drive could be used for storing bikes. Shop and pub approx 1 mile. Note: Fuel tariff: April to end September £30 per week; October to end March £50 per week. Langdale Leisure Club membership included for four persons; extra daily passes available from the club at £15/£20 per adult per day or £10 per child (15 and under) per day. If you are looking for a comfortable retreat for a family holiday at any time of the year you really need look no further. This most desirable holiday home is in a truly delightful setting in the magnificent valley of Great Langdale. Childrens swing in the garden. Children welcome from any age. Rawfell offers weekly bookings starting on Friday.